Many people consider trash cans placed on the edge of a driveway to be an eyesore. The trash cans could be kept in a garage and out of sight or left outside for convenience. However, they can easily become a problem based on the curb appeal of a home. 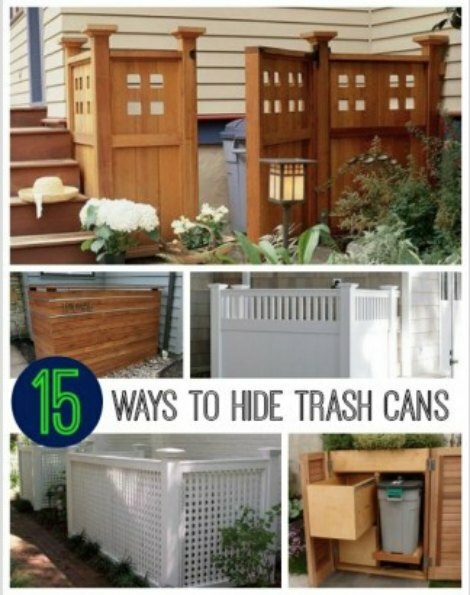 If you are interested in a way to hide trash cans at your home, then read on for many ideas. The key to any solution used to hide trash cans is to make it look as aesthetically pleasing as possible. This will often mean that a particular design will need to be used to make the solution fit in with the look of your home. If you have a tall fence or other structure you can use to hide trash cans, then you may be all set. However, a DIY construction project may be necessary to create a suitable hiding place. You have the option to use anything from a simple solution to a quite complex and time consuming solution to hide trash cans. The solution that you use will depend on your preference, need, or other things. This includes the cost of materials used to create a barrier or a hiding place for a trash can. All the materials you will need to create a barrier to hide trash cans can easily be found at a local home improvement store. You have the option to use lattice, wood fencing, or other materials. The cost of the materials may also dictate the type of barrier or particular solution you will use. Depending on the style you choose, a few tools will be needed to make a barrier to hide trash cans. The tools you will use include a saw, hammer, and perhaps a power drill. You may also need to build forms if you plan to create a wall, a barrier, or a platform using concrete. One important detail to keep in mind is the most simple solution may be the most effective.